On another one of my excursions,while simultaneously getting from lecture to lecture in the downtown core, is a discovery that has now made me a regular at their restaurant. The Saj is a introduction made by one of my close friends, and aims to serve some quality Mediterranean foods. Quick, beautiful wraps in a matter of a few minutes, is ideal for the busy student. I managed to finally take a photo of the food I ate there when I went with my best friend, whom I mentioned in previous posts, is a big foodie herself! On the left is my selection of wrap; I have in hand the Chicken Saj Wrap, which is delightful simply because it’s perfection in a wrap. 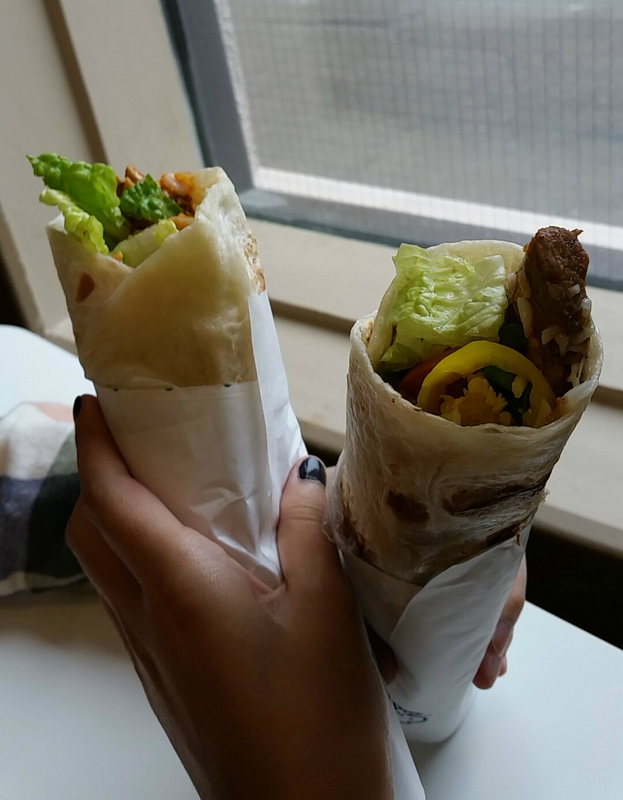 The wrap itself is beautifully prepared on a hot griddle, and the chicken is seasoned nicely. The service is also top notch (the one who makes the wrap for me knows my face now!) and they offer a selection of different toppings to personalize your wrap. I usually get the Garlic Parmesan Sauce inside, however I decided to try something new and put Chipotle Sauce instead. This sauce had a more “spicy” feel, although it wasn’t spicy enough for me to complain. In my wraps I also like adding all the favourites such as olives, lettuce, tomato, roasted red peppers and cheese. My friend’s first selection at The Saj was different from mine; she ordered the Steak Saj Wrap, and she tried that out with Garlic Parmesan and an assortment of vegetables. She’s a spicy fan, so she put hot sauce in her wrap, along with different chilli too. She was clearly impressed with the wrap, as it was very tasty, and very filling as well!